Kris Mbah is a 31 year old resident of Kalamazoo who went on a 9 day hunger strike because he believes KPS students do not have the resources, more specifically textbooks, to succeed. Mbah has been very vocal about his concerns, and has been to plenty of school board meetings to try to persuade the Board to “assign our kids textbooks”. At the most recent KPS board meeting on January 22, Mbah presented a petition with 236 signatures. “I decided to go on this strike because of my love of Kalamazoo, my love of teaching, and my love of the youth,” said Mbah. Mbah’s hunger strike is an old way of non-violent protest used by Gandhi and other world leaders and protesters. “Its like dying for a long time,” said Mbah. According to Mbah, he experienced weight loss during his hunger strike, but he says that the prospect of being able to make a difference in the community helped him through it. 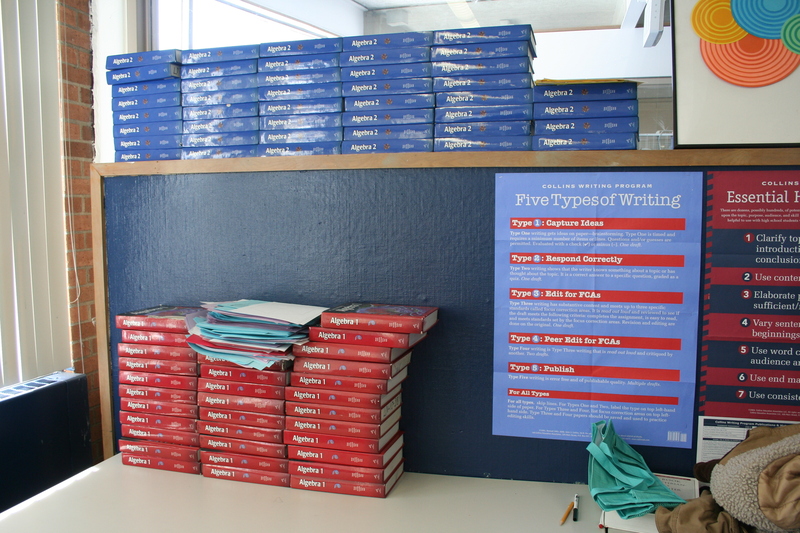 Many teachers at a KPS high school, Loy Norrix, say that they have never experienced a situation where they did not have enough textbooks to teach their class. Teachers reported back overwhelmingly at Loy Norrix that there is not a problem with the way that KPS handles textbooks. Some teachers even report back an excess of textbooks. “My Latin students have always had texts and consumable workbooks at all levels,” said Loy Norrix Latin teacher Barbara Felkel. Teachers believe that the reason that some kids do not have textbooks is because they are not taking the initiative to take home a textbook for themselves. In classes like gym, drama, and art, there are not necessarily textbooks that are part of the curriculum at all. Some classrooms offer an online textbook, though students report back the flaws in that system. “Textbooks online are not always available and do not always work,” said Cori Vanostran, a junior at Loy Norrix. While teachers report that Mbah’s statements are inaccurate, the students have a more mixed response. Of 100 students formally surveyed at Loy Norrix High School, forty seven said yes to the question, “Have you ever been unable to complete homework/ study because you did not have a textbook (Not because you forgot it, but because your teacher did not give you one). Another question was asked on the same survey, “Are there classes for which you have been issued a textbook that you are permitted to take home?” and only three people out of one hundred answered no. This is an interesting development in effort to get to the bottom of this problem. Kalamazoo Public Schools has spent one million dollars on textbooks annually every year for the past five years, according to Johnny Edwards, head of secondary education for KPS. Students at Loy Norrix fall to both sides of the issue, some acknowledging that there is some sort of problem within KPS regarding textbooks, and some stating that they have always had the textbooks that they need to succeed and be successful. “I don’t believe we are unsuccessful without textbooks because even when we don’t have enough books, teachers have the worksheets we need,” said Evelyn Banks, a student at Loy Norrix. “Although textbooks are very expensive, students in public schools deserve the right to have them provided for them,” said Megan Lohner, another Loy Norrix student. Mbah believes that the textbook issue is an administrative oversight at all KPS schools, and wants to see the problem resolved quickly. But at a recent KPS board meeting on January 22, Mbah was met with a flurry of students defending the district, stating that they had never had a problem with textbooks at KPS.